The first time I saw the gullwing doors on a DeLorean DMC-12 open, in Back To The Future, it was abundantly clear something important was happening. Something cool. Then I learned that it had a chassis engineered by Colin Chapman and a body designed by Giorgetto Giugiaro. Then I read about the cocaine and the stunning fall from grace. Then I visited the headquarters of the company dedicated to keeping the brand alive. Then I got to drive one. The story of our pilgrimage to the reborn Mecca of stainless steel '80s sports car dreams below. 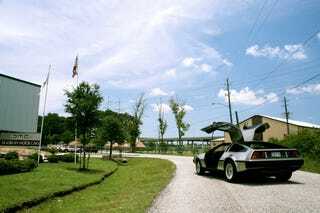 The first thing that I noticed as CEO Stephen Wynne showed me around the main facility of the DeLorean Motor Company, tucked away in a tree-hidden neighborhood outside of Houston, are the rows and rows and rows of gullwing doors. He's got around 1,000 doors; 500 left and 500 right. He also has numerous copies of the 2,850 other parts that makeup the DeLorean, still in the shelving units from the factory in Belfast, Ireland. Also check out our look inside the future of DeLorean. To understand how a factory in Northern Ireland landed in a small town in southeast Texas requires a brief history lesson. Designed to be an affordable and attractive mid-engined sports car by famed American engineer and auto executive John DeLorean, the DMC-12 was built in Belfast as part of a deal with the British Government, which fronted a great deal of money for the project. After a long period of design changes and budget issues, Delorean began construction in early 1981 and continued until late 1982, when the company went bankrupt and John DeLorean was arrested on charges of conspiracy to traffic drugs (he was later let go after proving entrapment). Hoping to continue to bilk money from the government in order to save the company, which was happy to have the employment in Northern Ireland, DeLorean ordered up parts for more cars from the suppliers. The last unfinished cars were assembled by a company now known as Big Lots — no joke — and all the cars, parts and even the storage bins were shipped to Columbus, Ohio, where they sat until Wynne bought it all and transported it to Houston. And though he has enough parts to last "two-and-a-half lifetimes" by his own estimates, he also has the engineering documents for every piece, meaning that the company is able to authentically rebuild parts that have gone extinct. The company's business model includes normal operations, such as running service centers in five U.S. states and The Netherlands, as well as selling parts and DMC-branded merchandise to enthusiasts. There's also a quarterly publication, deloreans, which not only chronicles the car's history and provides technical and historical information, but also works as a convincing sales tool. I totally want to replace the stock bulbs with LED lights... and I don't even own a DeLorean. The company has also been working with suppliers to develop interior, engine and suspension enhancements for owners. In the works is a stage-three supercharged engine kit with a goal of 250-to-300 horsepower, assuming they can make the technology durable. Finally, the company is in the process of building a handful of new-build cars using a mixture of original parts and new components. Basically, a new car with a mixture of old and new technology. Given how enthusiastic DeLorean owners are about their cars, it's probably a fairly sustainable business. On the day I toured the shop, architect Don Williams was excited to be picking up his car, one of the 1983 "Big Lots" models. His love for the car is so great that the DMC-12 is his daily driver, having sold off his RX-7 and motorcycle. Upon his death, the Smithsonian has agreed to take his car (it doesn't have one yet). For Williams, the main reason he owns one is "vanity." His claim was that there are few other cars one could drive that would draw as much attention. This was a theory I had to put to the test, so Wynne and I jumped in a recently renovated 1982 model DMC-12 with the upgraded Eibach suspension. The interior is definitely 1980s era, despite the MP3-player. The switches for the small working windows are as large as dominoes. Despite the grey plastics, the interior does feel quasi-futuristic, heightened by the clunk as you pull the doors towards you. Nevertheless, it's surprisingly roomy for a mid-engined sports car, designed to fit the large frame of the 6' 4" DeLorean. Though not exactly quick, the car's V6, designed as a joint venture between Peugeot-Renault-Volvo, provides enough power to keep up with traffic (around 137 horsepower in stock form). Even as we zoom past the time travel-inducing speed of 88 mph towards the century mark, the car feels remarkably solid considering it is actually older than I am. But I'm too busy enjoying traffic slipping by to notice whether anyone notices us. We pull into a Sonic drive-in for pictures and novelty's sake before moving to the Starbucks for an afternoon caffeine fix. It's there that one of the car's quirks becomes clear. Because of the door design, the glass can't roll down. Instead, a much smaller portion of the window retracts, not exactly ideal for anything larger than a coffee cup. To facilitate getting the coffee you have to open up the gullwing door, something that immediately amuses the young woman running the drive-thru. There are no cupholders, a minor drawback, so we sip our coffees in the parking lot of a nearby bank as car after car after truck (it is Texas) slows down to check it out. I've driven a range of production and prototype cars and this, I must admit, is the most attention I've gotten. Williams says that he ends up letting people take pictures in his car nearly every time he goes to a crowded place. Wynne repeats this sentiment, noting how most people won't approach the owner of a Ferrari or a Porsche (nor has history taught me that they want to be approached) but that they'll happily walk up to someone in a DMC-12. Coffee finished and back on the road, visibility isn't much of an issue, though I immediately feel lower than any car on the road. The pedals are also quite close together, making me wish I'd worn narrower shoes. I engage the clutch and search for first, momentarily confused by the five-speed's gear setup (reverse is down left, not down right). Out onto the somewhat crowded road I accelerate, if that's the right word for it, past slower traffic. It's about as fast as my fiancee's Honda Civic, though it feels like I'm going much faster. Overall, the tuned suspension helps it stay remarkably smooth over bumps. It doesn't seem at all a chore to drive and, opposed to popular myth, the A/C holds up well to the Texas heat. There's no power steering and, though the backbone chassis design is similar to that of a Lotus Esprit and the new suspension helps keep me from scraping the steel body along the ground, there's more effort needed to steer than you'd expect for a car that weighs in around 2,700 pounds. I'm at least glad the disc brakes on all the corners work, because when the speedometer goes out I'm too busy trying to estimate my speed to undertake any sharp stops. Given the choice to turn left toward the factory or U-turn for more fun in the DMC-12 I understandably take the latter. Though it's certainly more work to drive than a modern sports car, it's still fun. The design is so unique and the history of the car so rich that the more undesirable aspects of driving sort of drift away. Back at HQ the car gets driven back into the shop while I wander once more into the great warehouse to take pictures and marvel at the walls of parts and the novelty of a small slice of European and American automotive history existing, so well-preserved, in freaking Humble, Texas.